V. Krishna Ananth teaches at the Department of History, Sikkim University. He did his PhD from the Centre for Historical Studies, Jawaharlal Nehru University, New Delhi. He joined The Hindu in 1991 and reported on national politics for 13 years, and has also contributed to editorials and op-ed articles for the paper on national politics and developmental issues. Dr Ananth was associated with the Asian College of Journalism (ACJ), Chennai, ever since its inception in July 2000, lecturing on Indian history, contemporary Indian politics, legal and constitutional issues, and training journalism students on news writing and editing. 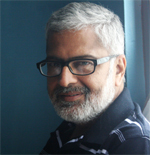 A freelance writer since 2004, he practiced law at the Madras High Court, specializing in writ jurisdiction, labour disputes, human rights, and the RTI Act. Dr Ananth has authored four books—India since Independence: Making Sense of Indian Politics (2009), Politics in the Times of Churning (2014), Arasiyal Suvadugal (Tamil) (2006) and Emergency: Nadanthathu Enna? (Tamil) (2007)—and contributed articles in edited volumes, journals, and newspapers. He was a fellow at the Nehru Memorial Museum and Library, New Delhi (May 2009–April 2011), during which he researched on the Retreat of the Nehruvian Socialist Project: A Study on the Political, Legislative and the Judicial Interventions, and this volume is based on that study.